The iEdge SG MOE Index is a free-float, market capitalisation-weighted index that measures the performance of listed maritime and offshore (MOE) companies in Singapore. The Index comprises 12 constituents, with a combined market cap of about S$30 billion. In the YTD, the 5 best-performing Index constituents were: Yangzijiang Shipbuilding (+14.4%), Marco Polo Marine (+5.3%), Sembcorp Marine (+5.2%), COSCO Shipping (+4.5%), and Keppel Corp (+3.7%). They have averaged a total return of +6.6% over the period. The five Index constituents that posted the strongest price rebound from their 52W lows were: Yangzijiang Shipbuilding (70.2%), Vallianz (26.7%), Mermaid Maritime (12.5%), COSCO Shipping (9.7%), and Sembcorp Marine (8.7%). They have averaged a 25.6% rebound from their respective 12M troughs, in line with the YTD rebound in oil prices. 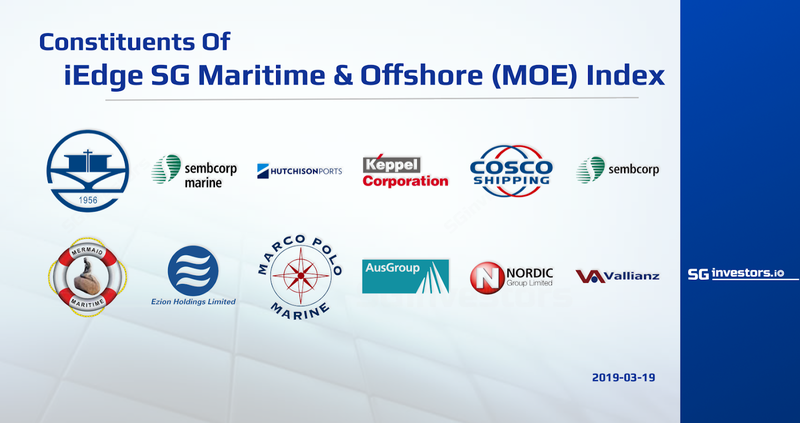 The iEdge SG MOE Index is a free-float, market capitalisation-weighted index that measures the performance of listed maritime and offshore (MOE) companies in Singapore. Constituents in the Index include shipyard operators, shipping companies as well as those providing port and offshore services. The Index comprises 12 constituents with a combined market capitalisation of about S$30 billion. The components with the 5 biggest weights – Yangzijiang Shipbuilding (15.21%), Sembcorp Marine (11.04%), Hutchison Port Holdings Trust (10.73%), Keppel Corp (10.59%), and COSCO Shipping International (10.55%) – account for more than half the Index’s weighting. Singapore’s offshore and marine industry has been battered by a slump in oil prices over the past few years, cutbacks in exploration and production (E&P) spending, weak charter rates and delayed projects. This has forced a number of players to cut costs and restructure debt. However, since the start of 2019, WTI crude has gained nearly 30%, and is set for its strongest advance since 2009. The Organization of Petroleum Exporting Countries (OPEC) and its partners – known as OPEC+ – have reduced output, while US sanctions on Iran and Venezuela have tightened supplies. Over the weekend, OPEC+ met in Azerbaijan to monitor their crude supply reduction pact, and said they would exceed commitments in the coming months. On Sunday, Saudi Arabia signalled that producers may need to extend their 1.2 million barrels per day of supply curbs past June into the second half of the year. In the 2019 year-to-date, the five, best-performing Index constituents were: Yangzijiang Shipbuilding (+14.4%), Marco Polo Marine (+5.3%), Sembcorp Marine (+5.2%), COSCO Shipping International (+4.5%), and Keppel Corp (+3.7%). They averaged a total return of +6.6% in the YTD, bringing their one-year and three-year total returns to -22.5% and -4.4%. The table details the 12 constituents of the iEdge SG MOE Index, sorted by YTD total return. The 5 Index constituents that posted the strongest price recovery from their 52-week lows were: Yangzijiang Shipbuilding (70.2%), Vallianz Holdings (26.7%), Mermaid Maritime (12.5%), COSCO Shipping (9.7%), and Sembcorp Marine (8.7%). These five stocks have averaged a 25.6% rebound from their respective 12-month troughs. The table details the 12 constituents of the iEdge SG MOE Index, sorted by percentage price gain from 52-week lows.